On the 16, 17 and 18 January every year in Novoli (in Lecce province) the town creates the biggest bonfire in the Mediterranean in honour of its patron saint, Saint Antonio Abate. 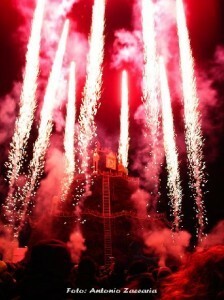 This unique event brings visitors from near and far to enjoy the spectacular “festival of fire”.La Fòcara bonfire is 25 metres high and 20 metres in diameter. It’s made from around 80,000 bundles of dried vine branches from the Parco del Negroamaro tied and placed using special techniques which have been passed down from father to son and are jealously guarded. The preparations for the bonfire are lengthy and start on 8 December, culminating in the lighting of the fire on 16 January.The origins of this ceremony are unknown, but most likely date from the Byzantine era. Saint Antonio is also the patron saint of farm animals.